There are some recipes in our home that get made over and over again. These are my go-to recipes for many different reasons. Some make the list because I always seem to have the stuff on hand to make them; some get promoted because they are definitive crowd pleasers and friends ask for them again and again; some are just darn easy and perfect for when I don’t feel like cooking. (Yes, it happens to me from time to time!) My arsenal of family favorites has grown to a complete library of recipes so I decided to start a new series called Friday Favorites. 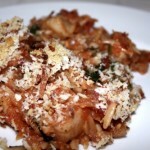 Every Friday I will provide one my tried and true recipes that my family enjoys over and over again. So make sure to check back often to see what recipes you can add to your family favorites list! 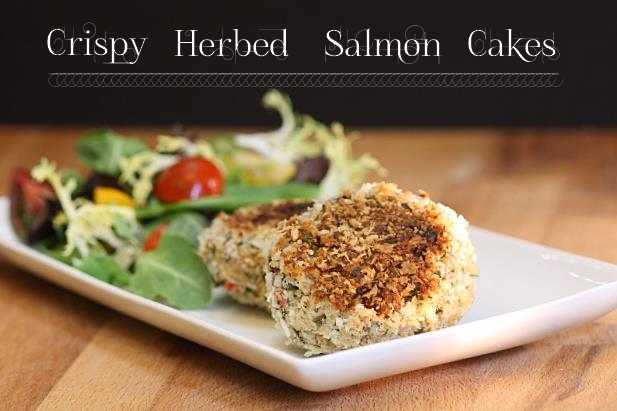 Salmon cakes were a favorite of mine growing up. My mother and I would make them together when I was a kid. I loved to squish the salmon, egg and bread crumb through my miniature fingers, feeling all the gooey and crunchy textures. Canned salmon has bones in it but they are edible and they were my favorite part. 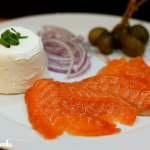 As I was eating them, I would get so excited to find a round bone in the salmon cake, like it as a little prize that I savored by crunching it between my teeth. I was a big fan of different textures in meals even at a young age. 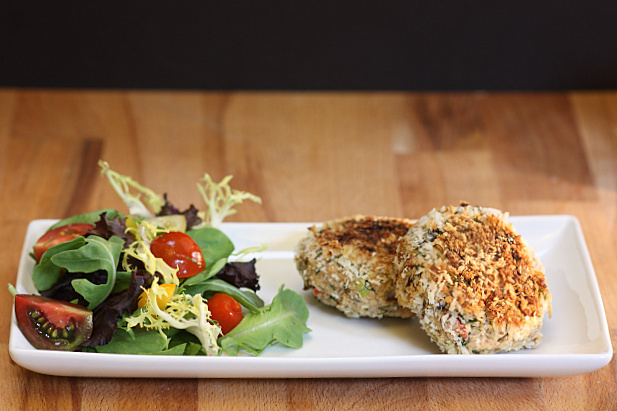 The best part about making salmon cakes was actually making them. My mother would chop up the ingredients and put them in the bowl while I opened the cans and dumped the fish in. Then we would giggle as I mushed the mixture together and we formed them into patties. Cooking with my mother was effortless and it still is. 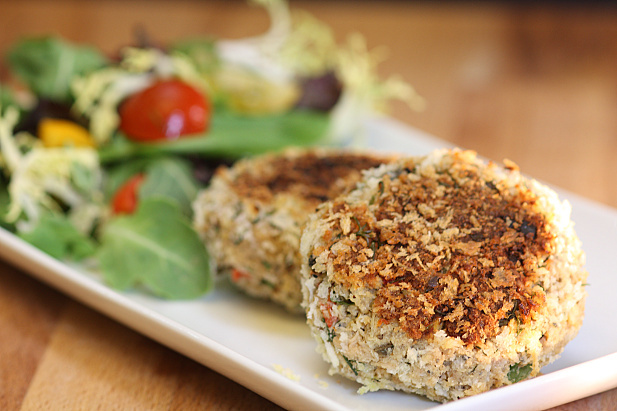 When I make these salmon cakes now, I use whatever herbs I have on hand with a little onion and bell pepper (which I always keep in the fridge). Although we used regular bread crumbs when I was a child, I find the panko bread crumbs give them a delightfully crispy texture that crunches under your fork when you dig into them. 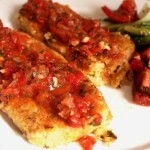 These salmon cakes can be made ahead of time and frozen and also make great leftovers that can be heated up in the oven! Drain the canned salmon and put it in a large bowl. Add the lemon zest, dill, parsley, scallions, red pepper, salt, pepper, Old Bay and 2/3 cup of the panko. Crush the capers with a fork and add them to the mixture. Lightly whip the eggs with a fork and add them to the mixture. Using your hands, mix together all the ingredients in the bowl just until combined. 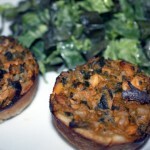 Form the salmon mixture into patties slightly smaller than palm size, about 2 inches in diameter. Place on a tray and put into the freezer for 5 minutes. Meanwhile, heat a skillet over medium heat. Place the remaining 1/3 cup panko in a bowl. 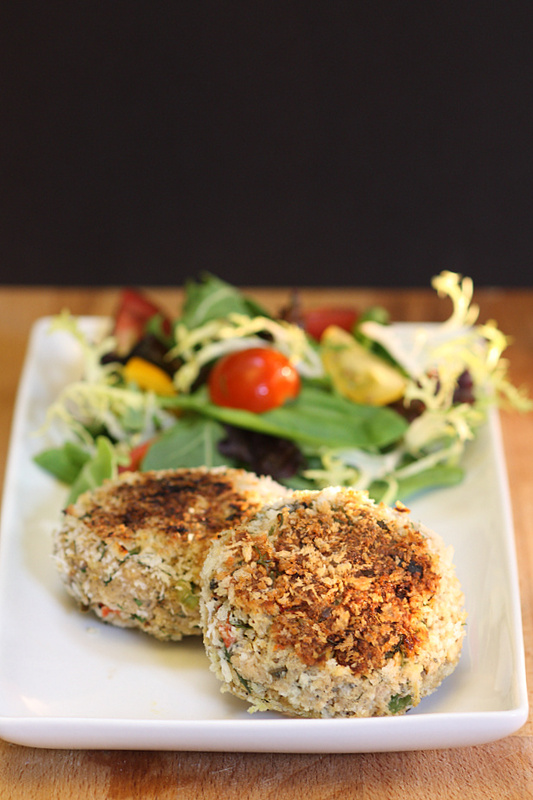 Remove the salmon cakes from the freezer and coat each one in the panko, lightly pressing the crumbs onto the patty. Coat the skillet with an oil mister or cooking spray and arrange the patties evenly on the surface. Cook, 10 minutes each side or until golden brown and heated through. If you freeze the uncooked patties, freeze before the final coat of panko and defrost in the refrigerator overnight before cooking. Thank you so very much, Consuelo! It’s lovely to meet you. Yummy!! I love all the fresh flavors paired with the canned salmon. Especially the dill!